How does one balance the need to breastfeed/express in public whilst not making others uncomfortable? Just sew a couple of nettings into a typical scarf to hold the pump and power supply for easy-on-the-go. The cheapest and fastest to market product we’ve seen among the ideas. 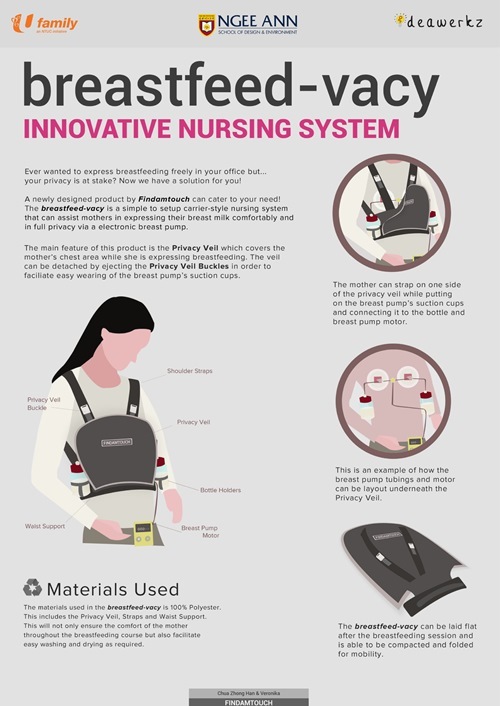 This device, which is inflated by an air pump, can be placed against any wall to provide an opaque barrier for the nursing mum. Lightweight and easy to inflate/deflate are cool factors in its favour. Our favourite part about the Hexashield is that not only is it simple to set up, it comes with mini hexagonal modules incorporating various functionalities as a power plug, seat, table and more. The multiplicity of functions that could be derived from this modular design will be good opportunities for innovation. Mums needing to express on long journeys will like this innovation which allows them to express anywhere, anytime, while freeing up their hands to manage other tasks. » Is Whatsapp invading on your personal life?